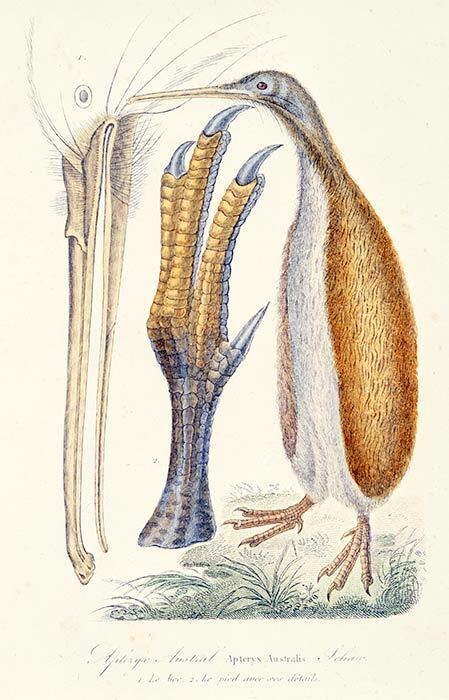 The first illustration of a kiwi by a European appeared in 1813 in The naturalist’s miscellany, a periodical with George Shaw as author and members of the Nodder family as publishers. The illustration, by Richard Nodder, was based on a dried skin that had arrived in England the previous year. The result was a fanciful image with short legs and the upright stance of a penguin. This engraving is a copy of that image, and was published in Rene Primever Lesson’s Voyage autour du monde entrepris par ordre du gouvernement sur la corvette la Coquille (1838–39) .